Those of us who work in the wine business rarely go to Milan. But I try to go every chance I get: not only is Milan where many of my friends from Padua university days live and work (in the publishing industry), it’s also one of the most thrilling European cultural capitals, one of the best places in Italy to eat seafood (surprising but true), and now the subject of a microblog devoted to the city as botanical garden. The author and curator is one of my oldest and dearest friends in Italy, Stefano Spigariol. You can follow the microblog via #MilanoBotanica or by visiting the Facebook of Linaria, a Milanese publisher and non-profit environmental activist group. The wonderful project has received a lot of attention from both literary and gardening circles in Italy. What fascinates me about it is how it speaks to a theme that pervades the twentieth-century Italian narrative: the natural alienation (estrangement) of citizens who migrate from rural areas to major urban centers. While I grew up in a big city and have lived in big cities all of my life, many of my Italian friends — like Stefano — left small towns in rural areas to study in major metropoles. Stefano’s taxonomic “discovery” of urban botanical Milan represents a subversion of such alienation, however fleeting. Earlier this week, my song-writing partner, who was visiting us in Austin, treated Tracie P, Georgia P, and me to dinner at one of the River City’s most swank and high-profile restaurants. The food was great as always (if you know the Austin dining scene, you are familiar with the restaurant); the waitstaff sharp, precise, professional, polite, and highly informed; and the wines by-the-glass and sake by-the-glass selection excellent. There was just one thing missing: the boundless warmth and affection that Georgia P had become accustomed to during our trip to Italy. No, there were no rolled eyes or mumbled editorials. The staff at said restaurant was professional and thoroughly courteous. But we couldn’t help but notice that Georgia P was disappointed when she wasn’t greeted with the shower of attention that she received at every restaurant where we dined in Italy. I took the photo above at the restaurant Lab 52 (no website) on the famous Rotonda a Mare in Senigallia (Ancona), where we shared a meal with our new friends Alessandro (left) and Silvia from the Pievalta winery in nearby Jesi. One of the highlights of the meal, btw, was crescia, the classic savory flatbread of the Marches (Le Marche) topped with Prosciutto di Carpegna. Traveling in Italy as a parent was a new and thrilling experience — in many ways. But the best part was watching Georgia P light up as restaurateurs and patrons made a fuss over her and competed for the reward of her sweet laughter and smiles. In the post-Berlusconi age, Italy and Italians face a number of challenges — some of them touching the very heart of their identity. But there are some things that, happily, remain unchanged there. Like the pure, unmitigated joy of watching a baby slurp up long noodles tossed with clams and tomato sauce. New York-based and Italocentric wine industry publicist Susannah Gold and Morellino di Scansano growers association president Giacomo Pondini led a tasting of seven expressions of Morellino di Scansano yesterday afternoon at Tony’s in Houston. Here are my highlights from the luncheon event. According to its back label, the 2010 Morellino di Scansano by Roccapesta is mostly Sangiovese (Morellino) with a small amount of Ciliegiolo. I loved the wine (look at the color!). From what Giacomo told me, its a newish winery launched by a Milanese entrepreneur who recently acquired an estate in Scansano. The aging is large cask and cement (music to my ears), he said. It wasn’t my favorite in the flight (see below), lacking the focus it needs to achieve true greatness. But Roccapesta clearly has the right stuff: the materia prima is there and the attitude and approach are 100% right on. I’m really looking forward to following this winery and winemaker as they evolve. If you’re pouring Roccapesta, please call me! The 2010 Morellino di Scansano Brumaio by Pietramora is 100% Sangiovese and 150% awesome and delicious, one of the best expressions of Morellino that I’ve tasted in recent memory. Just cast your gaze upon the gorgeous color of this wine! It really captured what — to me — is the essence of Morellino: extreme freshness and dark berry fruit combined with a gentle gamey quality that evokes the maquis — la macchia — of the Maremma. I can only wonder if the proprietary name of the wine, Brumaio, is an oblique reference to Napoleon, who spent his last years in exile on the island of Elba off the Tuscan coast. Brumaio, from the Latin bruma, is an ancient word for the winter solstice. But it’s also the name, brumaire in French, of the second month of autumn in the French Republican calendar. Of course, it could also be an allusion to Karl Marx’s Eighteenth Brumaire of Louis Napoleon. It probably refers to the bruma (also called brumaio), the morning mist that covers the vineyards of Maremma in the fall as the grapes ripen. Thanks again, Susannah and Giacomo, for bringing some great Morellino to Texas and for any excuse to revisit one of the greatest works by Marx! 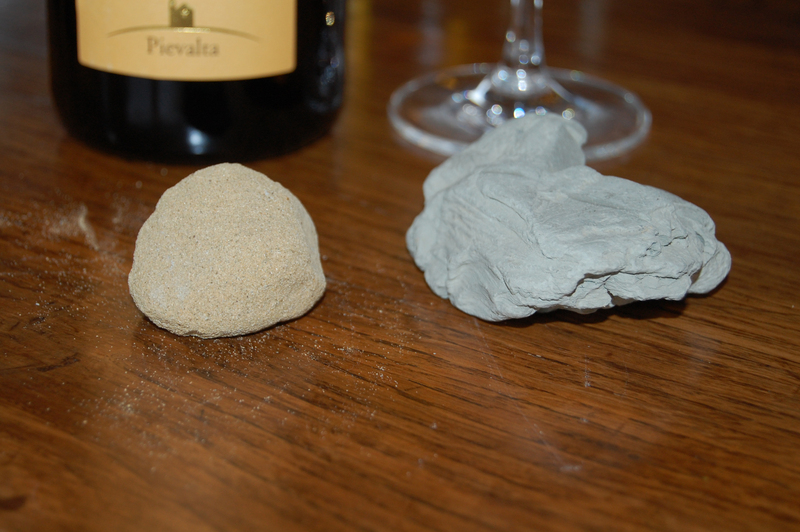 Above: Samples of tufaceous (left) and calcareous (right) subsoils from Jesi. Click the image for a high-resolution version. One of the most exciting winery visits on our recent trip to Italy was with winemakers Alessandro Fenino and Silvia Loschi at the Pievalta winery in the heart of the Castelli di Jesi. The roughly ten-year-old winery is the first and only Demeter-certified winery in Jesi and the wines are truly stunning in their ability to deliver bright, balanced acidity with a breath-taking range of fruit and minerality. We loved the wines and we loved Alessandro and Siliva, with whom we became fast friends (more on them later). Above: My favorite wine was the entry-level Dominè (named after a local tavern keeper), made from grapes grown in calcareous soils. It was lighter in body and fresher than the more structured San Paolo Riserva, Tracie P’s favorite, grown partly in tufaceous soils, more tannic and unctuous and deeper in its minerality. Both wines were superb. Not to be confused with Loire valley’s tuffeau (according to the Oxford Companion to Wine; in French, the Italian tufo is rendered as tufe or tuffe), “calcareous tufa [or tufo is] ‘a porous or vesicular carbonate of lime, generally deposited near the sources and along the courses of calcareous springs’ (Page Handbk. Geol. Terms, 1865),” according to the Oxford English Dictionary. Calcareous, on the other hand, comes from calcaire, “French word for limestone, a rock largely made up of calcium carbonate, which may in English be described as calcareous” (Oxford Companion to Wine). Central and southern Italy are rich in tufo. You’ll find tufo covering the Piazza del Campo of Siena when the Palio is run. Many believe that Tuscan tufo is what gives Vernaccia di San Gimignano its distinctive minerality. Of course, there’s also the famous (however tiny) village of Tufo in Campania, where Greco di Tufo is grown in tufaceous subsoils. And these are just a few of the examples of how limestone expresses itself through tufo in Italy. Note how the tufo in the photo above is friable. You can see the dust it produce just by being handled, however gently. It’s one of the subsoil categories that makes Italy such a unique place to raise wine. From Brooklyn (above), to Austin, to La Jolla, Tracie P, Georgia P, and I wish you a happy and healthy new year! This was how young winemaker Nicola Ferrari, founder and owner of Monte Santoccio in Valpolicella, described the ethos of his wines and his approach to winemaking when he and I tasted his wines together in the Veneto a few weeks ago. Nicola is the second Valpolicella producer to emerge from the Quintarelli bottega. The first was Luca Fedrigo of L’Arco (see my thread on Luca and Quintarelli here). Both spent the greater part of their formative winemaking years working side-by-side with Quintarelli, while Valpolicella master “Bepi” (as he was known affectionately to all) was at the peak of his career (Quintarelli succumbed to a long battle with Parkinson’s disease in January of this year). It’s unusual to hear a young Italian winemaker describe her/his wines in such socially conscious and ideologically aware tones. And it may be even more surprising to some in the light of the fact that Quintarelli’s wines are among the most expensive on the market today, accessible only a small subset of wine lovers who have the means to afford them. But Nicola (like his counterpart Luca) is no ordinary Italian winemaker: he’s a member of a dwindling number of producers who have been anointed by the “greatest generation” in Italian wine — the “masters” who oversaw the Italian wine renaissance of the last three decades (I’m thinking of Dante Scaglione, Maria Teresa Mascarello, Augusto Cappellano, not necessarily in that order). I loved the wines, across the board: old-school, large-cask aged Valpolicella, Valpolicella Ripasso, and Amarone, perhaps not as finely focused at Quintarelli from the 1990s and early 2000s but gorgeous and brilliant, with a nervy (if sometimes unruly) acidity that will serve the wine well in the cellar. And Nicola is true to his word: according to WineSearcher results, you can find his Valpolicella Superiore Ripasso for just $25 at Wine House in LA (and the Amarone for $62; thank you, Lance Montalto!). The stunner for me was the ripasso. But Quintarelli doesn’t write “ripasso” on his label, I pointed out. “He never wrote ripasso but he always used ripasso for his Valpolicella,” Nicola told me. Nicola studied education and community activism at the University of Verona before he turned to winemaking and our conversation spanned from his favorite memories of Quintarelli to his first experience with the writings of Primo Levi (one of my favorite Italian authors). I couldn’t help but think of the enormous disconnect between the way Quintarelli’s legacy is perceived in the U.S. and the way that young people view him “on the ground” in the Veneto. Regardless of the elitist ethos projected on to Quintarelli by his north American purveyors, he is still considered a populist winemaker in the Veneto and is only spoken of in adoring and affectionate terms. Brunello growers and bottlers association president Fabrizio Bindocci (above) is appealing to the Italian agriculture ministry to reinterpret current appellation regulations and allow emergency irrigation without revising legislation. As I wrote on Friday for the Houston Press, one thing was achingly apparent during our recent two-week trip from northernmost Italy to the tip of the heel of the boot, traveling through ten of Italy’s twenty regions: prolonged heat and drought have seriously impacted growers and winemakers over the last decade and their acceptance of climate change is no longer subject of debate but rather resignation in the face of an unavoidable truth. Climate change — marked by prolonged summer heat and drought — is the cause for the sharp drop in Italy’s grape production for 2012. It was also the reason behind the light vintages of 2007, 2008, 2009, and 2011. Now, as a result, another scarce year adds to the lack of wine from previous vintages lying in Italian cellars. In the space of just a few short years, we have shifted from a situation in which Italy perennially produced a surplus of wine to the current shortage. Off the record, among the score of growers and winemakers I talked to over the last two weeks, many compared 2012 to the disastrous annus horribilis 2003, when unrelenting heat and drought decimated Sangiovese vineyards in Montalcino, the first in a series of warm-hot vintages that have challenged growers and producers of fine wines. In Montalcino, the situation is aggravated by the fact that emergency irrigation — irrigazione di soccorso — is not prescribed by appellation regulations. Above: For growers with ideal vineyard sites, like Laura Brunelli (Podernovi-Le Chiuse di Sotto [Montalcino]), the quality of fruit is excellent. The problem is that there will be less of it in 2012 (as for Bindocci’s Il Poggione). Even Laura conceded that she would have irrigated this year in certain spots if the appellation allowed it. In the light of the warming trend, Fabrizio has been lobbying for many years (since 2003) to change the appellation regulations and allow for emergency irrigation. When I met with him a week ago Saturday, he told me that he is currently preparing a request for “clarification” from the Italian agriculture ministry. Apparently, the appellation regulations make no mention of emergency irrigation (or whether it is allowed or not). 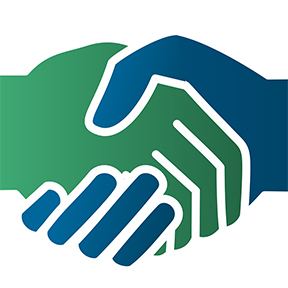 Bindocci’s move, if successful, would also eliminate potential bureaucratic delays and headaches: now that EU technocrats in Brussels have to rubberstamp any changes to appellation regulations issued by Rome, a whole new layer of red tape has been added to the process. “If the minister declares that, according to the letter of the law, irrigation is legal because it is not referenced in the regulations, we could potentially begin right away,” although the Italian government summer recess, which just ended, would seem to preclude that possibility at this point. A deux ex machina from the Italian government would also resolve another set of local and political issues for the growers association (and these are my words, not Fabrizio’s). What an incredible trip it’s been, in so many ways. But most of all because it was Georgia P’s first (and it was our first as parents). We spent our last night in Venice at an airport hotel. Of course, we’re happy to be heading back to Texas after two weeks on the road. Georgia P has had a great time and we’re blessed with a baby who loves to sleep in the car. One of my best friends ever and my roommate from my first year at the university of Padua (1987), Steve, came out to meet Georgia P and join us for dinner (he lives with his family in nearby Padua). It was great to see him and share the joy of Georgia P’s smiles and laughter (and her love for bigoli al ragù). I’ll be taking a break from blogging for the next days and will see you on Tuesday after the first day of the Jewish new year. Thanks for following along, everyone, and sharing this unforgettable trip with us. I have so much to tell about the winemakers we spoke to and the new wines we discovered. In the meantime, may G-d bless you and may your new year be filled with health, sweetness, and happiness.